The Grand Mercure Bangkok Asoke Residence welcomes you with typical Thai hospitality to a sought after part in the city. Located in Sukhumvit Soi 19 the hotel offers affordable luxury accommodation and close proximity to Asoke BTS skytrain station, restaurants and shopping malls. The entertainment of Soi Cowboy is steps away and Nana Plaza is within a 20 minute walk. The hotel's full range of hotel facilities include a rooftop swimming pool and terrace, wi-fi internet and meeting facilities to ensures total convenience for both leisure and business guests. Guests can enjoy fine Italian dining at Viva Vino restaurant while being entertained by a live band or simply sit down for a cocktail in the relaxing atmosphere of the lobby lounge. Tasteful furnishings and plush comfort defines the classy room options at Grand Mercure. Combined with a full range of luxury amenities such as equipped kitchenettes, refrigerators, international TV channels and more means 4 star luxury at its best. 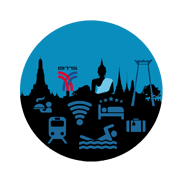 Use this opportunity to easily compare prices of all the best travel sites to guarantee the best deal.